Amar Amari was the last opponent that went the distance with GGG roughly seven years ago when the Kazakh fighter had his one and only bout in Denmark. The bout was chief support for Mikkel Kessler’s feature attraction against Dimitry Sartison which ended with Sartison being taken out of the ring on a stretcher. Since that point Golovkin has taken out every single fighter that stood in his way and did so to the delight of boxing fans all over the world. I first heard about Golovkin from my good friend Gennadiy Komarnitzky with whom I collaborated on the “Soviet Legends” series of articles for this website. Gennadiy K, even before GGG became the sort of star he is now, already echoed the sentiment back then that we are talking about a caliber of fighter comparable to Roy Jones, and Floyd Mayweather, and not just another run of the mill “prospect.” In fact in our article about Victor Ageev you can read an excerpt from GK mentioned GGG in the same breath as RJjr and FMjr. Of course saying such things or discussing them beforehand is one thing while actually accomplishing them is quite another. 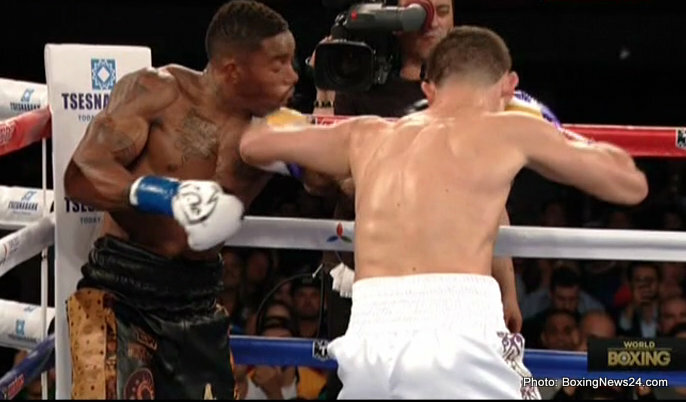 Recently in watching GGG dismantle a very underrated fighter in Willie Monroe Jr my thoughts wandered back to Denmark and the one time I spoke with GGG over the phone. Michael Marley who at that point was working with the promotional team of Mogens Palle and Kessler gave GGG his cellphone in the dressing room to conduct the interview moments after Golovkin went the distance for what is currently the last time in his career. Though the sound quality is bad (and I only recorded it for reference as it was done for an article) the description features the translation of the interview in full (I spoke to GGG in Russian as his English was none existent at that point). Of particular note is that even back then GGG said that fighting and succeeding in the USA was where his future will lead and of course even back then he mentioned the name Miguel Cotto. Sure it is one thing to mention it when you are a European prospect fighting mostly in Germany and it is quite another to look 7 years down the road, and 20 KO’s later and see that he has already accomplished what he set out to do back in 2008. Many fighters talk the way GGG did way back when but not many are able to do it. So, at least from a personal standpoint and perspective as a witness to that point in GGG’s career and history I feel that is what makes him elite and a big name title fight something he earned. Furthermore, boxing fans and boxing will only be better off if Canelo, Cotto, or even Mayweather step in the ring against him.